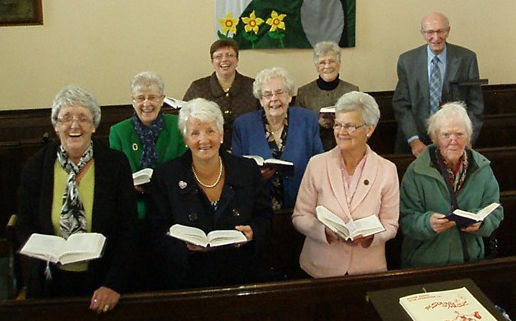 The Church choir was re-introduced into Bothkennar Church in 1999, so that hymns and songs appropriate to worship but beyond what the congregation would know, could be used in Church services. This was quickly embraced by the organist and about 10 choir members from the congregation. It was apparent that many in the congregation had secretly felt that there ought to be a choir again! As well as being present at all Sunday services to lead the singing, the choir has also joined with other church choirs in combined services. This included the large outdoor millennium service at Ochilview in Spring 2000. They have also visited local nursing homes at Christmas to entertain the residents and led the singing at weddings held in the Church. A highlight of the year is the annual Candlelit Supper held in December where the choir have regularly contributed. The choir is always keen to welcome new members. Anybody interested should speak to the organist or any choir member.